Developer and supplier of synthesizers including Chaosynth, Ice and Fluid. Designed for running sound cues and sound effects for live theatre productions. Sound enhancement software that reconstructs sound lost during compression in formats such as MP3. Developer of SFX for Windows 98/NT, designed to aid the sound designer and the sound technician in creating, maintaining, and executing sound effects, music, and show control for a live entertainment environment. This two-part series of excerpts from Chapter 17 of Java Examples in a Nutshell, 3rd Edition, David Flanagan illustrates some of Javas sound capabilities. In the first section, he covers how to play simple audio clips with the java.applet.AudioClip class. In the second section, he shows how to use the javax.sound.sampled and javax.sound.midi packages to load and play sound clips, how to monitor and change the playback position within a clip, and how to set audio parameters such as volume, balance, and tempo. Offers EasyRecorder, captures any sound your sound card plays and saves to WAV or MP3. Manufactures PC entertainment products with a focus on sound cards, including Sound Blaster. Audio processors and sound effects plug-ins in VST, DirectX, MAS, TDM, RTAS format. Tool to capture sound being played by other sound players, either from a file, from the Internet, audio CD, or microphone. Sound recording program, that records sound generated, or requested, by other computer programs. It can also convert wav files to mp3 format. A shareware recording tool that can capture any sound that your sound card can play. It also records from CD, microphone, or other input lines. Mobile ringtone and sound alert that combines an produced prealert sound which comes in various selections with a voiceover person who speaks any name requested. [Win] Sound editing application, record, process, and save sound or music files. Product specifications, screenshots, tutorial, FAQs, and downloads. Sound editing application, record, process, and save sound or music files. Product specifications, screenshots, tutorial, FAQs, and downloads. Internet audio production company develops sound tracks for Flash presentations and web pages. Products include voice greetings, jingles, music and sound effects. Custom software solutions for the entertainment industry and sound design services for musical theatre. Symbolic Sound Corporations Kyma is a graphical language for live, interactive sound generation and manipulation. 29 Sound On Sound Audio magazine. Professional live assist, automation and radio playout software for Windows. Supports multiple sound cards and multiple users. Free and commercial plug-ins for restoring analog feel to digital sound. Relive the grainy sound of old vinyl, the warmth of analog bass. If the business hours of Nyr Sound in may vary on holidays like Valentine’s Day, Washington’s Birthday, St. Patrick’s Day, Easter, Easter eve and Mother’s day. We display standard opening hours and price ranges in our profile site. We recommend to check out nyrsound.com for further information. 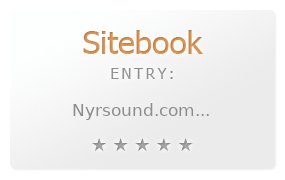 You can also search for Alternatives for nyrsound.com on our Review Site Sitebook.org All trademarks are the property of their respective owners. If we should delete this entry, please send us a short E-Mail.